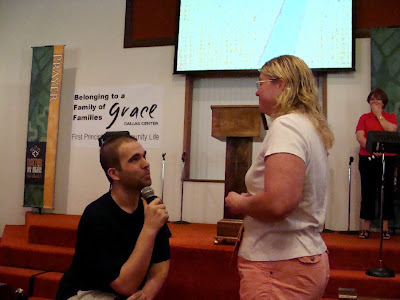 At the close of the Sunday morning service on June 22, Amy Starr was surprised when her boyfriend, Brandon Minger, called her to the front of the sanctuary and proposed to her on one knee at the Grace Brethren Church of Dallas Center, Iowa (Randy Todd, lead pastor). Through tears of joy, Amy responded with a yes and the two became engaged in front of the entire Dallas Center Grace Brethren congregation. Amy was baptized earlier in the service, so this particular Sunday was certainly a special one to be remembered. As mother of the groom to be, this posting blessed my heart! Thanks for the part you have played in their lives.